Tenzo from Tenzo on Vimeo. Tenzo helps multi-unit restaurants and retailers improve their bottom line by connecting all of their data sources and delivering actionable insights to the right person, in real time, through alerts and notifications on their phone. Tenzo gives you a view across all of your data sources, and recommends actions that ultimately improves your profitability. We are a tool for owners, store managers and employees to understand how to best run their business. Tenzo supports multiple locations. You can give different users different levels of access – either just to the data from one location, a group of locations or everything — and to different data items e.g., sales or social media. 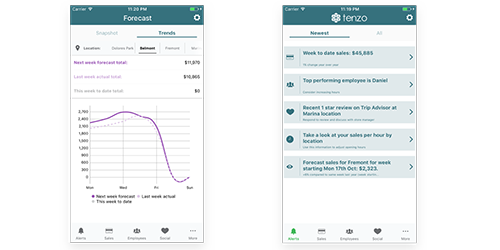 Tenzo helps retailers improve their bottom line by connecting all of their data sources and delivering actionable advice to the right person, in real time, through alerts and notifications on their phone. Our aim is to improve profitability by 20% by optimising labor, improving customer satisfaction and more accurately forecasting demand. 1) Tenzo aggregates data across multiple data sources e.g., inventory, labour etc. 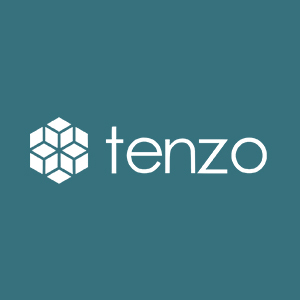 3) Tenzo uses machine learning and data science to make sure our recommendations are best-in-class. Tenzo brings together a combination of deep operator and leading technology experience. We’d backed by Techstars and have already been called one of the 99 startups reinventing the restaurant by CB insights. We’re committed to making our customers more profitable.